Here Comes the Viking 80! 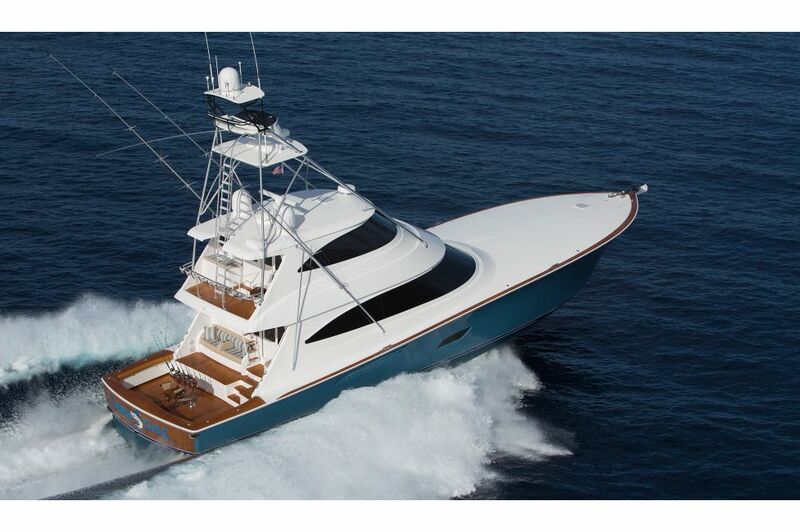 Viking has led the charge in the design, development and production of the biggest convertible sportfishing yachts for more than 20 years. Recognized around the world for quality and performance, Viking is often imitated, but never challenged where it counts out in the deep, on the tournament trail, or in the Winner’s Circle. This propensity for ongoing development is the root for building a better boat every day. 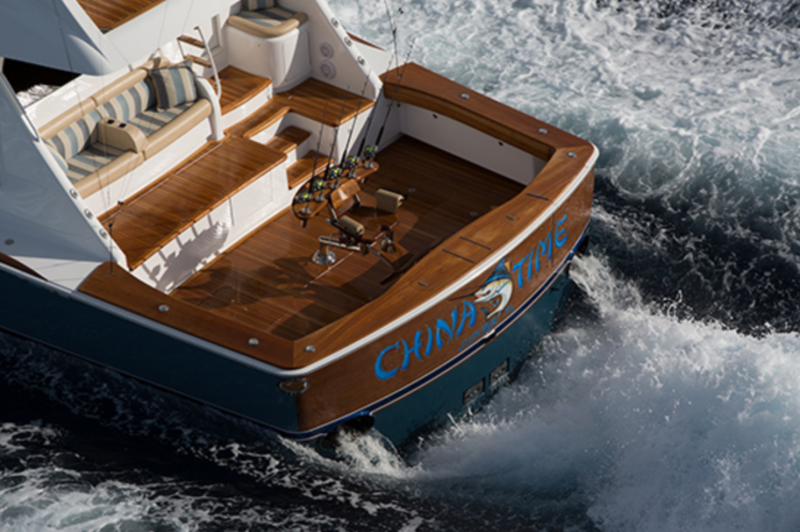 Like all Vikings, the 80 Convertible is manufactured to order and will provide its owner with a one-of-a-kind sportfishing yacht built and designed to fish and cruise in luxury and safety anywhere in the world. It is with great pride that we present the Viking 80 Convertible. 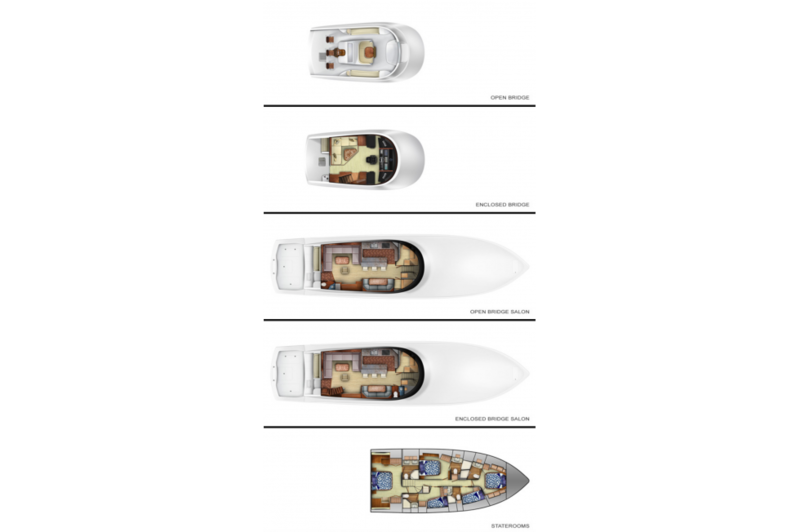 We cordially invite you to contact your Viking dealer to learn more about this incredible model and arrange a sea trial at your convenience. Like all Vikings, the 80 Convertible hones its blue-water DNA from its stable mates. The sleek styling showcases an impeccable sheer line with nine feet of freeboard forward tapering to slightly more than three feet at the stern, a lively reflection of the aggressive profiles of its recent brethren including the 92 and 62 Convertibles. The hull’s sharper entry merges with a higher forward chine designed to divert spray downward when ripping through head seas. Convex hull sections add curvature and form to the refined running surface, while a quad of molded running strakes accentuate lateral tracking and maneuverability. Tumblehome at the corners of the curved transom adds definition and beauty. Deadrise at the transom is 12.5 degrees and the beam is carried well aft providing exceptional volume, buoyancy and balance, a deft combination, which comfortably accommodates additional fuel, and the weight of a gyro stabilizer. 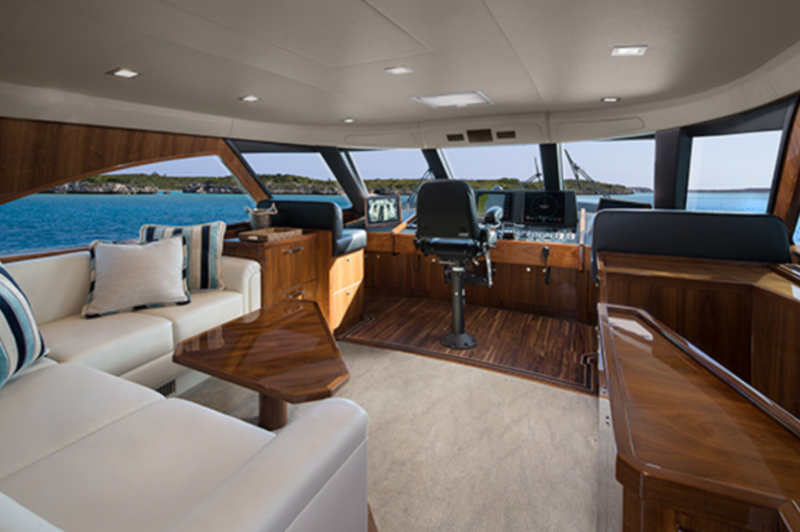 Subtle style cues including molded feature lines on the flying bridge and the deckhouse are further accented by the raked, metallic black windshield mask and the tinted teardrop salon windows. Sculpted hull vents and tinted portlights add sophisticated attention to detail and utility. To enhance performance and achieve better engine and propulsion efficiencies, the design, engineering and production teams shaved unnecessary poundage, while increasing strength and seakeeping capabilities. The resin infused hull is a sophisticated composite structure of Baltek end-grain balsa and Airex foam cores with Aramid and E-glass fiberglass laminates. Stringers are fiberglass encapsulated foam and bulkheads are fabricated with vacuumed bagged composites. Mechanically, the 80 Convertible shares a commonality of technical features proven time and time again for reliability and practicality at the thousand fathom line and beyond. Chilled water air conditioning provides cooling and heat throughout the yacht with individual thermostats in the staterooms and the salon for efficient climate control. A Delta-T engineroom ventilation system with thermostatically controlled supply and discharge fans provide proper fresh air circulation and water intrusion suppression. 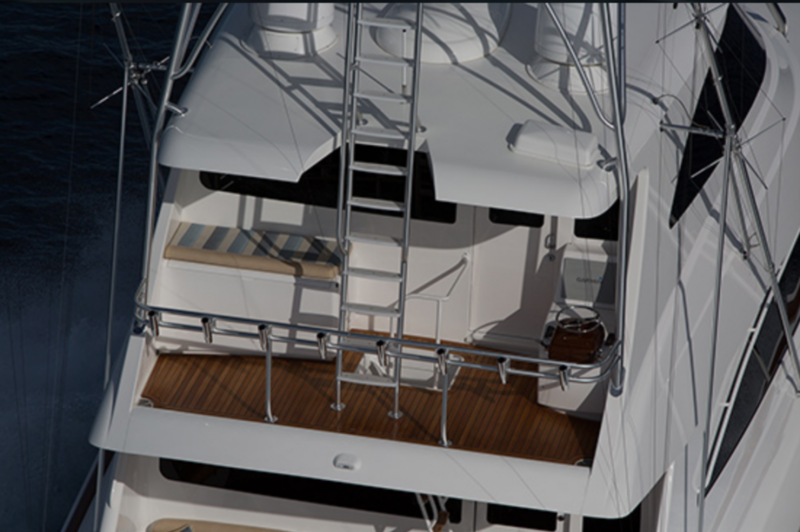 Pneumatically controlled engineroom ventilation dampers are integrated into the yacht’s fire suppression system. Viking’s proprietary VIPER (Viking Independent Programmable Electro-hydraulic Rudder) steering eliminates the tie-bar for independent rudder operation and optimizes response and reduces drag at low, mid and high speeds for extraordinary maneuverability in all sea conditions. A lengthy list of standard equipment includes a hydraulic bow thruster, a centralize seawater system, dual freshwater pumps, Veem S-class propellers, two 29 kW Onan generators, two Glendinning Cablemasters, Charles PM 100 shore power cord combiner and isolation transformer, and an Octoplex touch screen electrical distribution panel with monitors in the salon and on the flying bridge with manual back-up. Powered with tier 3 MTU Series 2000 V16 M96L engines each developing 2,635 mhp with Blue Vision controls and display monitors, our testing calculations indicate a top speed in excess of 40 knots with an effortless high 30 knot cruise, depending upon load, sea conditions and ambient environmental factors. These engines are the same as used aboard the 92 Convertible. It is interesting to note that MTU looked to Viking to be the first manufacturer to use this new propulsion system and Viking’s success with its 92 series verified the engines comprise a winning combination for speed, efficiency, range, acceleration and quietness, which will replicate aboard the new 80 Convertible. Entered through an electric sliding door on the cockpit mezzanine deck, the salon is a forest of satin walnut joinery and leather appointments, created by the artful direction from the team of the William Bales and Company. The 21 ft. 5 in. beam and the use of the vertical space is immediately apparent creating a free flowing movement with the ambiance of a great room. A day head is immediately to starboard. To port, a J lounge and coffee table is a virtual conference area, opposite walnut cabinetry housing a 60 in. flat screen television on an electric lift. 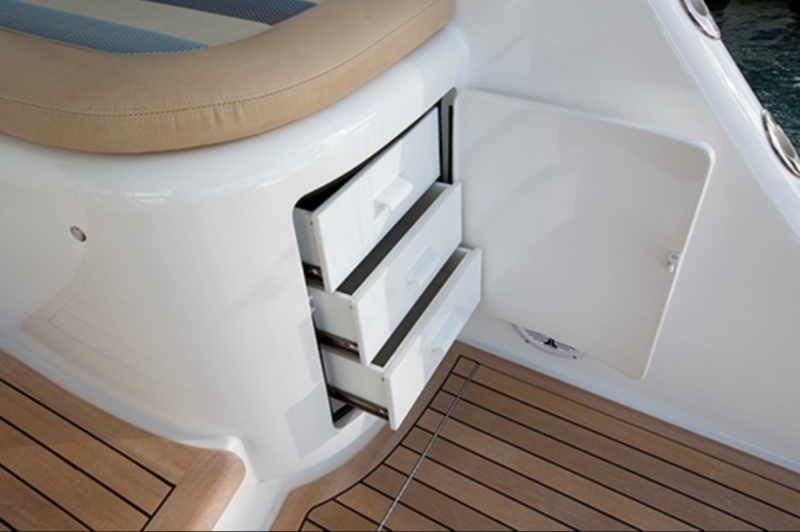 Forward to starboard a raised built-in dinette serves a dual purpose with rod stowage for 80 pound outfits. The fore and aft style of the galley maximizes useful space with under counter refrigeration beneath a second dining area with bar stools, while the outboard counter accommodates a double sink and electric cooktop. Forward of the galley, a versatile walk-in pantry is as spacious as a stateroom and can be outfitted as such. Inviting accommodations include five generously appointed staterooms, including a full beam master suite with a king size walk-around bed. 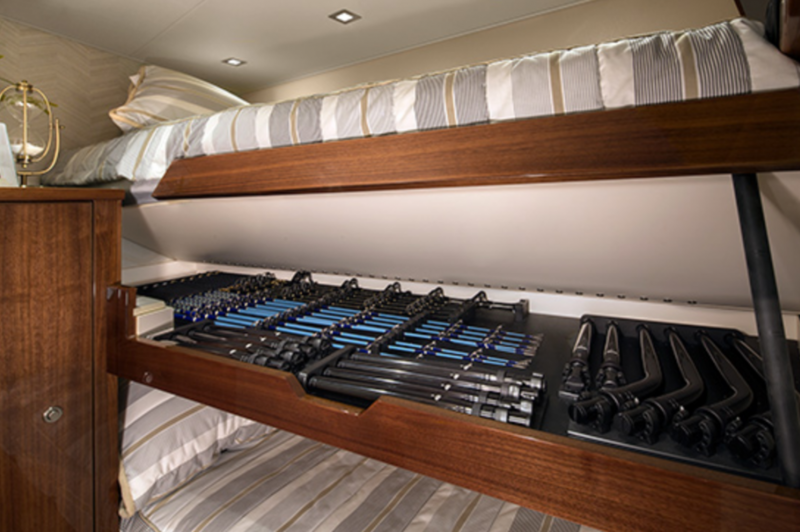 The port and forward staterooms have walk-around queen beds. The two starboard staterooms have upper and lower berths, and are surprisingly spacious thanks to the use of sliding entrance doors which maximize interior space. Every stateroom has a large head and fiberglass shower stall. 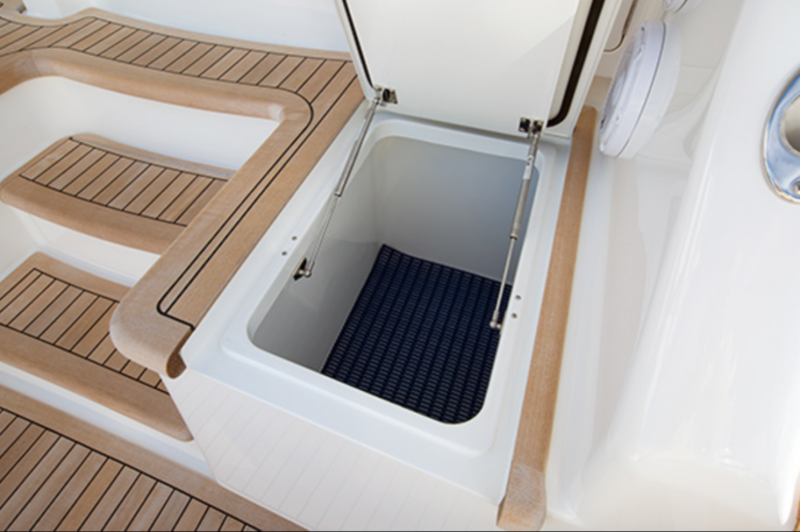 A washer and dryer are located in the companionway. 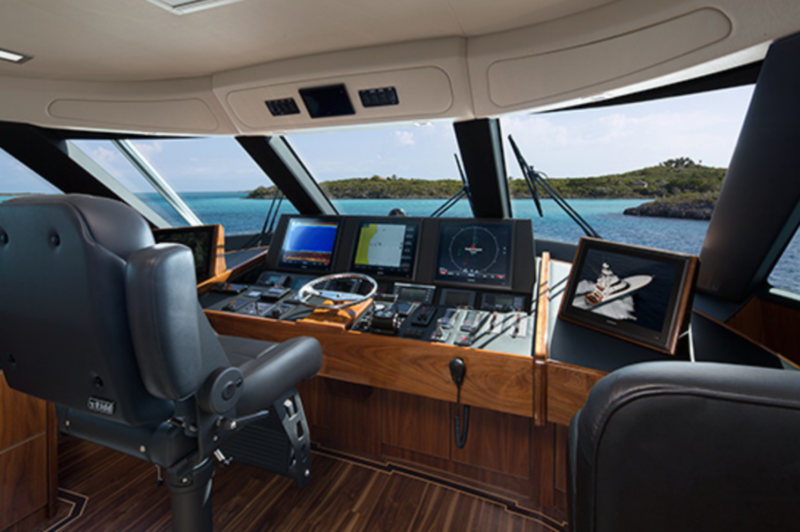 On the flying bridge, a center console command station gives the operator a great view underway and while fishing. Three pedestal helm seats are standard, and additional seating is available on port and starboard lounges, each with rod stowage below. A U-shape lounge and table forward of the console seats more guests, and is notably below the forward sightlines of the helmsman thanks to the raised standing platform behind the console. A freezer is forward between a refrigerated box and a sink with a freshwater outlet. 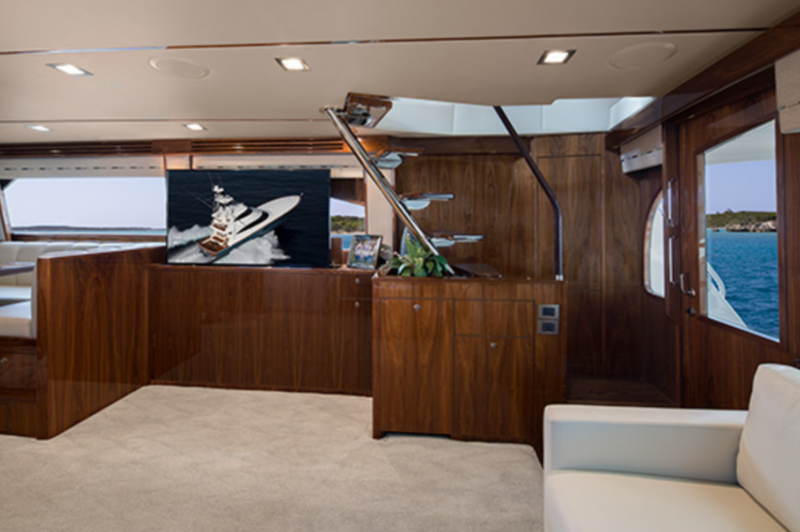 While air conditioning is available on the open flying bridge, a climate controlled enclosed bridge with access from the salon and the mezzanine deck also is available. Additionally, the enclosed bridge convertible also can be ordered with an open Sky Bridge. 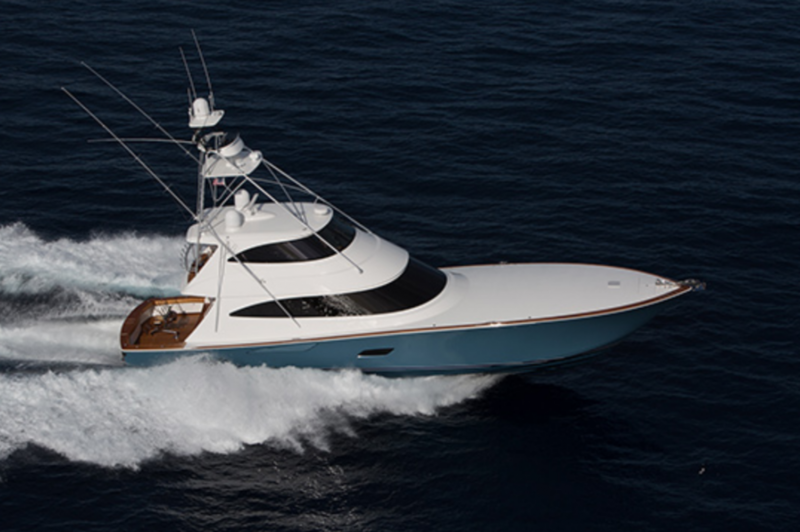 Viking’s subsidiaries Atlantic Marine Electronics and Palm Beach Towers will outfit the 80 Convertible with communication, navigation and entertainment accessories and its custom tuna tower respectively, which as in the case of all Vikings, allows turnkey delivery from the factory. 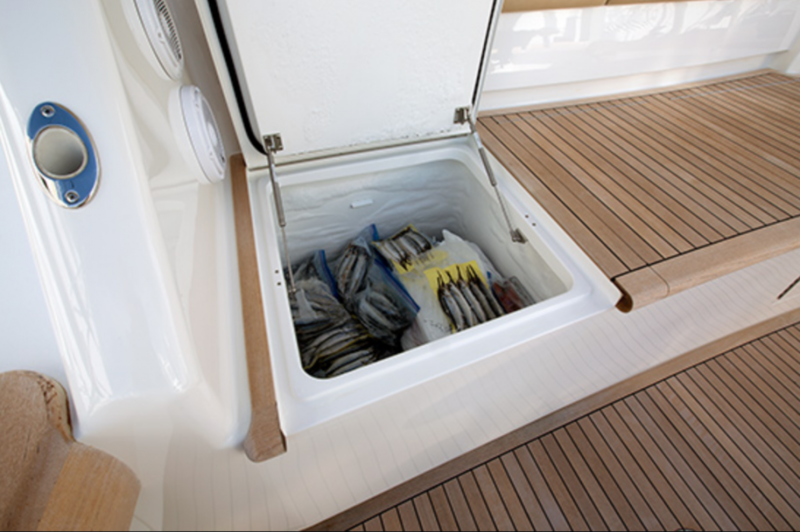 The 216 square-foot cockpit is equipped for tournament fishing with a transom door, freezer, tackle, and general stowage space, live well capacity, fish wells, an ice chest and a chill box for drinks. But some subtle touches also show that the Viking team never stops sweating the details to make things better. The base of the cockpit compartments, for example, are floating, which leaves room for a toe kick for easier access when opening the lids in a sea way. Another neat idea is that the mezzanine gently folds outward at each end making more foot space available in the cockpit. Finally, the 80 Convertible is prepped at the factory for the installation of the M26 Seakeeper gyro stabilizer, either on the production line or at a later date.